I took antibiotics last week (after about 6 weeks of being ill with a bad cough and various colds in between) and I feel like myself again! 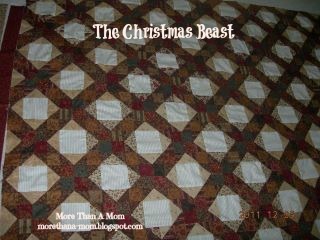 My dilemma with the Home Organization 101 challenge and completing the King-Size "2011 Christmas Beast" (that is now becoming the 2012 Christmas Beast!) has split my time and attention. (at least) on the quilt and get it done. This will allow me to complete the Office/craft room organization goal that I have because it will clear up a lot of space and give me a huge sigh of relief to have delivered it to my parents, the intended recipient. This is a photo of my current set up with the frames and my Kenmore machine. When the quilt is complete I plan to sort through the two garbage bags and several gallon bins full of donated yarn I have received to complete blankets for charity. That's going to be a fun but big project. 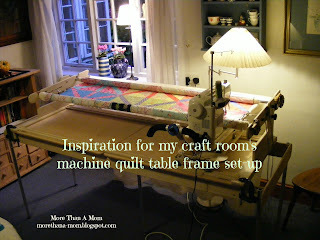 If you look closely underneath the frame in the photo above you can see the yarn bags/totes stuffed under the table! 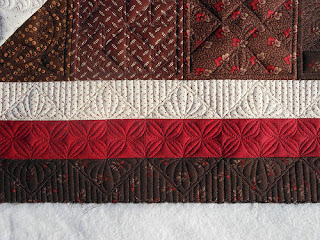 Here are my inspiration pictures from Green Fairy Quilts that I am hoping to even closely duplicate on this quilt. I love this border design. 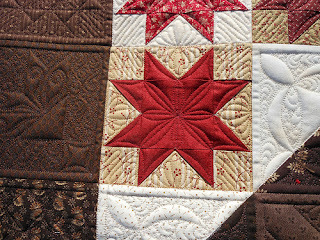 I used the triangles and flowers inside it on the red and green 3-cluster 2" borders. I did a loop design in the center one as I wasn't feeling the love or confidence to attempt the circles. If you look at the first photo you can see that the stars look like "x"s. I am trying to get them to pop. I am hoping this stitching pattern will do that. In terms of my sewing room, in addition to wanting this big project complete, when the room is cleared out I really want to make myself a crafting sanctuary with some soothing paint, WAY less clutter and some inspiring photos in the room. A girl can dream, right? This is my inspiration for the table frames. I love how the table lamp, the plate and the tea cups make it a cozy set up. I also have a board on Pinterest set up with inspiring sewing room photos.